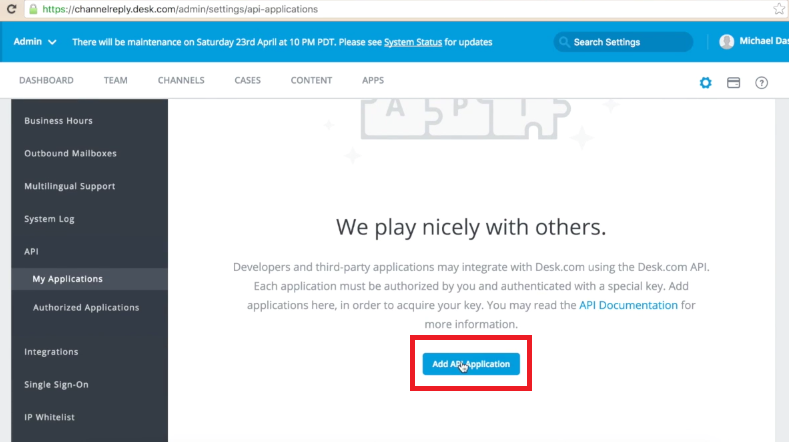 This step-by-step article will guide you through the Desk.com integration process. Read the following instructions or watch the how-to video below to see how it’s done. Note: Click on any image to see the full-sized screenshot. To begin, please log in to your Desk.com and ChannelReply accounts. To sign in to your ChannelReply account, click “Sign In.” If you don’t have an account with us yet, click “Start Free 14-Day Trial” instead. You can log in to your Desk account here. 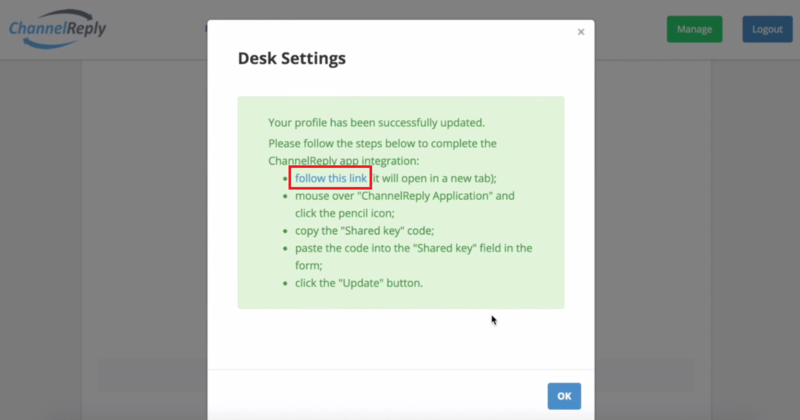 You will have the opportunity to fill in your basic user information, but you can skip this step for now by clicking “CRM settings.” Choose Desk.com as your service desk. 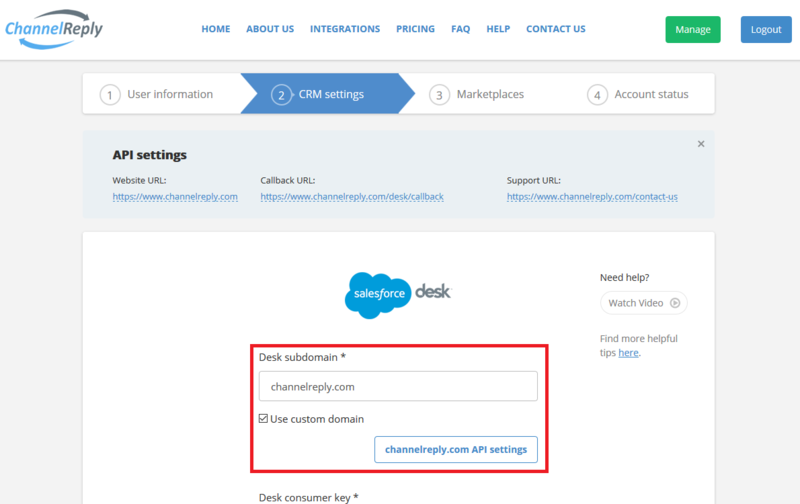 We need information about your Desk.com account in order to integrate it with ChannelReply. You will find most of this information under API -> My Applications on your Desk.com admin page. First, you need your Desk subdomain. 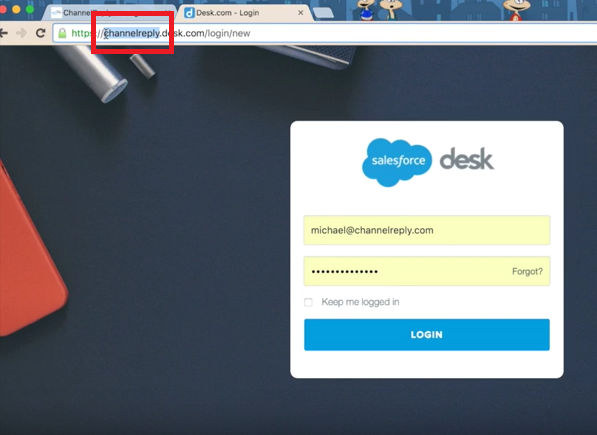 You can normally copy this from between https:// and .desk.com in your Desk admin page URL. Paste it into the “Desk subdomain” field. 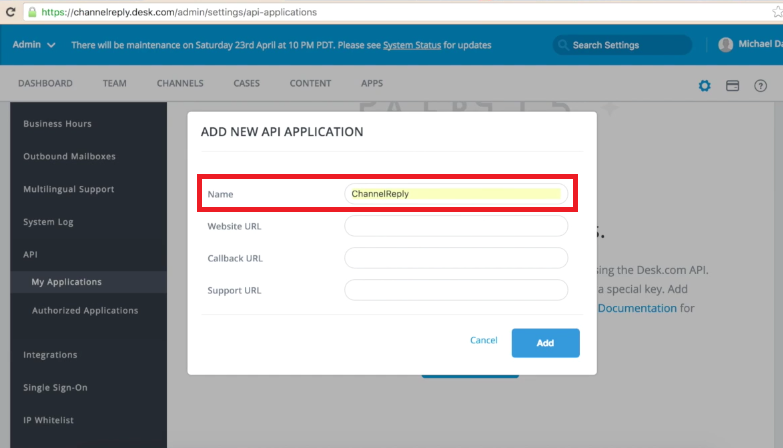 Your “API settings” button will instantly be customized to match the subdomain you have entered. 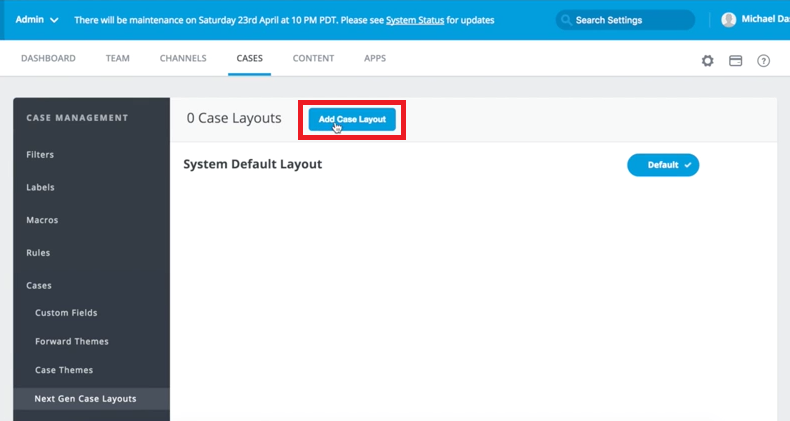 Alternatively, if you have your Support Center set up under your own domain name, check the “Use custom domain” box to remove “.desk.com” from the API settings button. Then enter your domain. The link will open in a new tab, where you can find your . . . 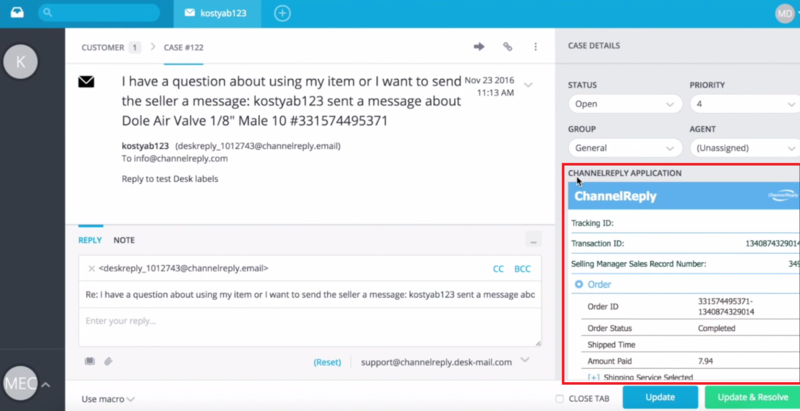 In the pop-up menu that appears, enter “ChannelReply” in the "Name" field. Return to your ChannelReply account. 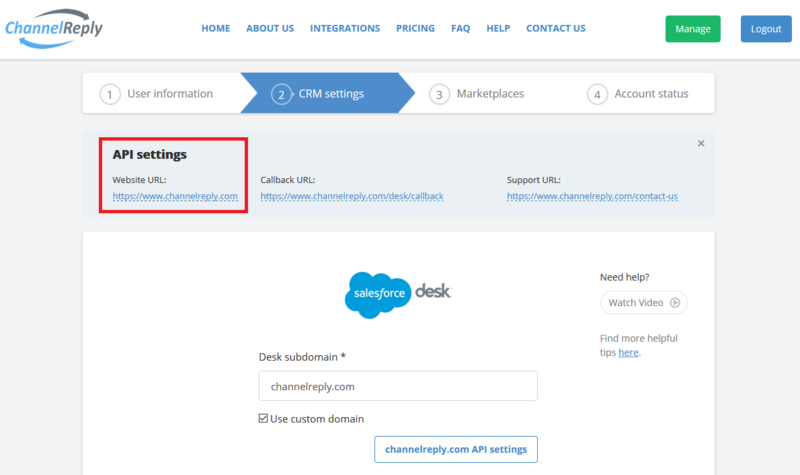 You’ll see the Website URL under “API settings.” Simply click on the Website URL we have provided to copy it to your clipboard. Switch back to your Desk account. 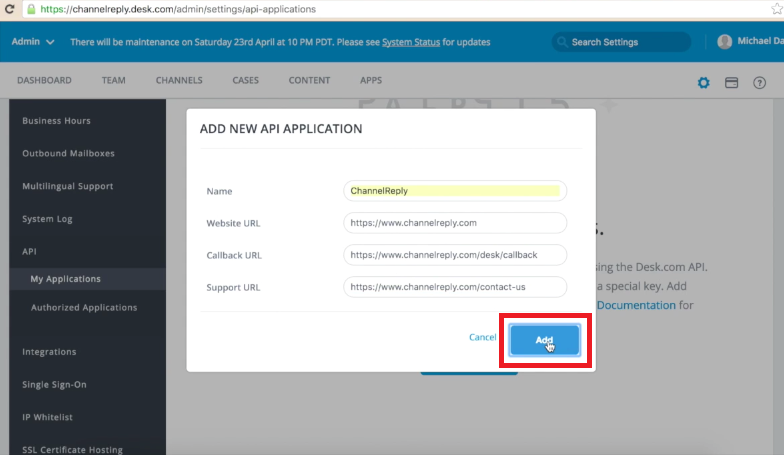 Paste the Website URL into the corresponding field in the “ADD NEW API APPLICATION” pop-up. ChannelReply should now appear in the My Applications screen. Copy the key shown under ChannelReply in My Applications. 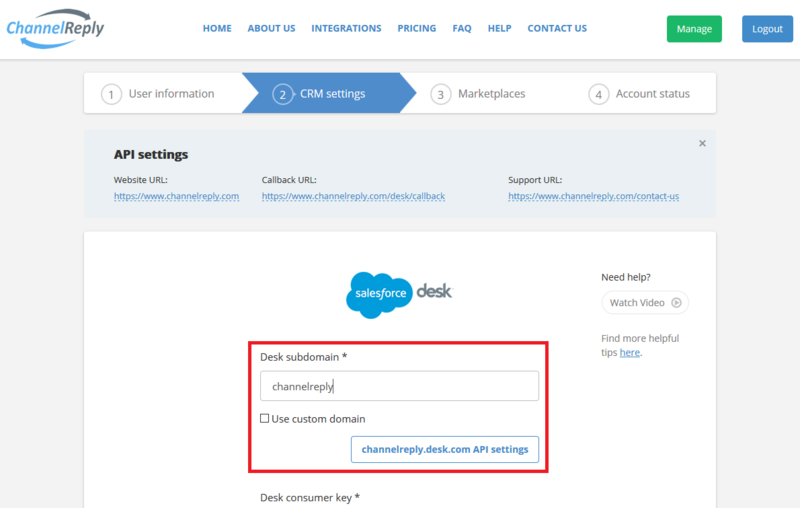 Then return to your ChannelReply admin page and paste it into the “Desk consumer key” field. Repeat with the "secret," pasting it into the “Desk consumer secret” field. To get your Desk token, return to your Desk admin page and click “Your Access Token.” Copy the token from the pop-up. 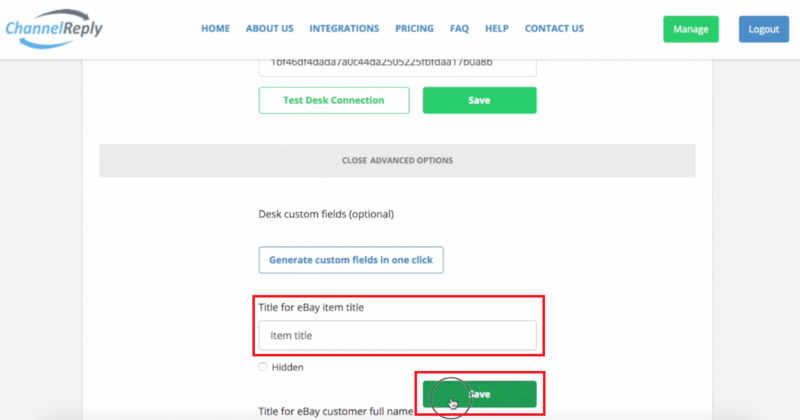 Paste the token into the “Desk token” field. Then copy your token secret and paste it into the “Desk token secret” field. You should see a success notification; click OK to close it. Click “Save” and a pop-up will appear with additional instructions. Click the blue “follow this link” text. Mouse over “ChannelReply Application,” then click the pencil icon. You will see a new popup with further instructions. 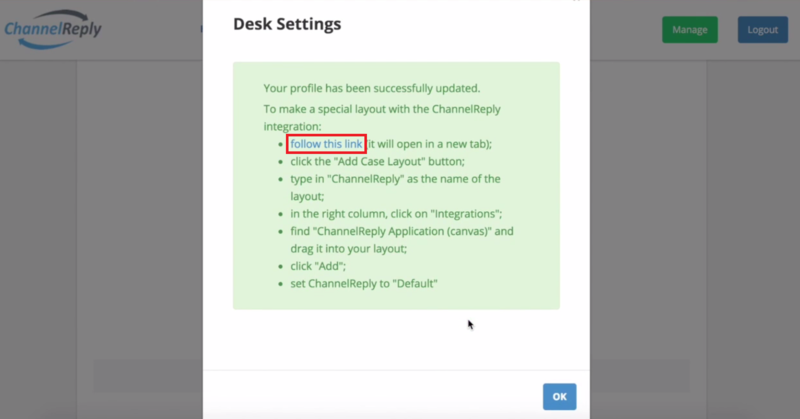 To create a special Desk layout incorporating ChannelReply, click the blue “follow this link” text. In the “Name” field, type in “ChannelReply.” Then select “Integrations.” “ChannelReply Application (canvas)” should appear. Click on “ChannelReply Application (canvas)” and drag it into your layout. Mouse over it and click the pencil icon that appears. Choose a height for ChannelReply to appear at in Desk. We recommend anything from 300 to 500. Once finished, click “Save” to finalize your changes. 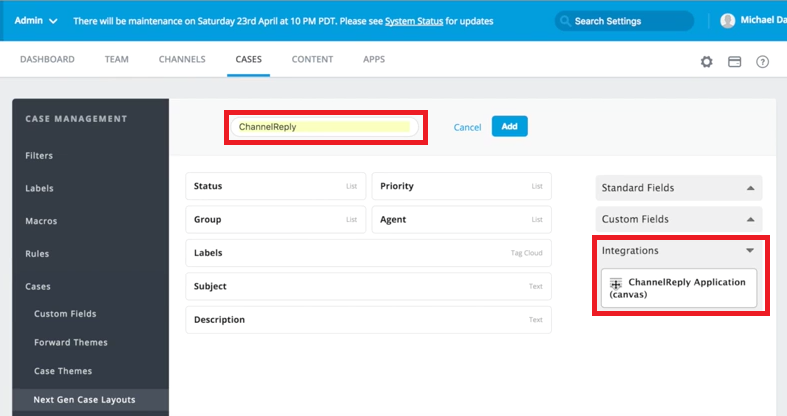 Set “ChannelReply” to “Default.” Then click on “Admin” in the upper left and select “Next Gen Agent.” Please note that ChannelReply will only appear in the Next Gen Agent interface. Open any case. 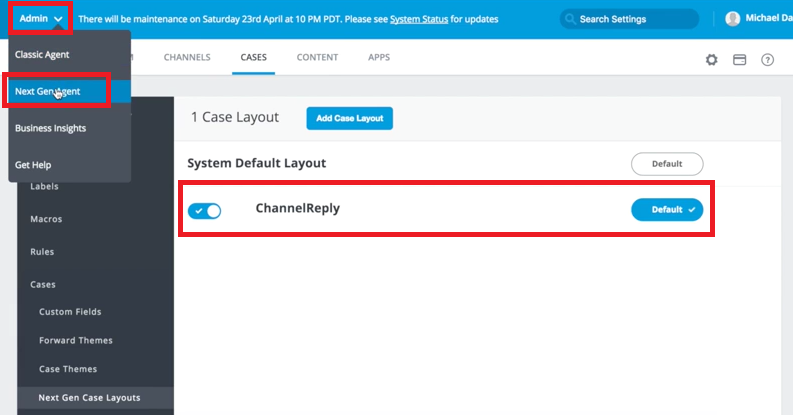 You will see “CHANNELREPLY APPLICATION” under “CASE DETAILS.” When you receive messages from marketplace accounts connected through ChannelReply, the order information and other important details will appear here. Clicking the plus and minus signs will allow you to expand or hide detailed info. In ChannelReply, you can now enter titles for your Desk custom fields. Click “OPEN ADVANCED OPTIONS” at the bottom of the page. You can simply click “Generate custom fields in one click” to enter default titles for all of them at once. Alternatively, you can customize each title individually. A new “Save” button will appear after you’ve entered your titles. Be sure to click on it when you are finished. Congratulations! You have now completed the Desk.com integration process. 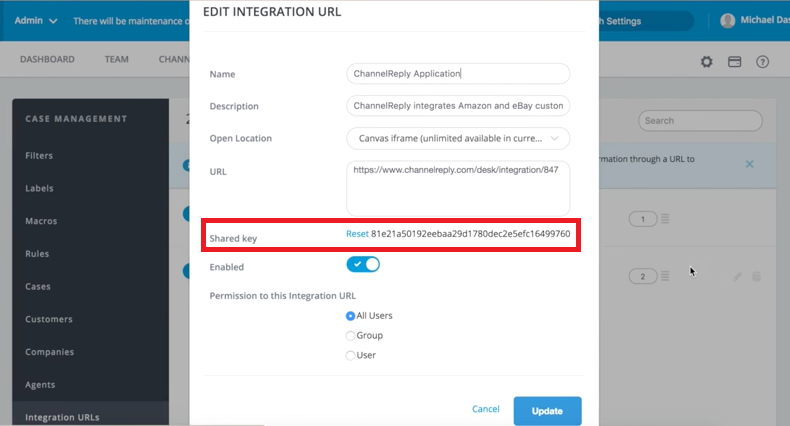 Be sure to read our other how-to articles on Amazon integration and eBay integration to complete the setup process. If you have any questions or run into any issues, please don’t hesitate to contact us for assistance.